Haider Jawad Kadhim Al-Abadi (or al-'Ibadi; Arabic: حيدر جواد كاظم العبادي‎‎, born 25 April 1952) is an Iraqi politician who has been Prime Minister of Iraq since September 2014. Previously he served as Minister of Communication from 2003 to 2004, in the first government after Saddam Hussein. A Muslim, he was designated as Prime Minister by President Fuad Masum on 11 August 2014 to succeed Nouri al-Maliki and was approved by the Iraqi parliament on 8 September 2014. Al-Abadi, who speaks English, graduated high school in 1970 from Central High School (Arabic: الإعدادية المركزية‎‎) in Baghdad. In 1975, he earned a Bachelor's degree in Electrical Engineering from the University of Technology in Baghdad. In 1980, he earned a PhD degree in Electrical engineering from the University of Manchester. Al-Abadi joined the Dawa Party in 1967. His three brothers were arrested in 1980, 1981, and 1982 for belonging to the Dawa Party. In 1977 he became the chief of the party while studying in London. In 1979 he became a member of the party's executive leadership. In 1983 the government confiscated al-Abadi's passport for conspiring against Iraq's Ba'ath Party. Al-Abadi was awarded a grant from the UK Department of Trade and Industry in 1998. While working in London in 2001 Al-Abadi registered a patent relating to rapid transit systems. In 2003, Al-Abadi became skeptical of the Coalition Provisional Authority (CPA) privatization plan, proposing to Paul Bremer that they had to wait for a legitimate government to be formed. In October 2003, Al-Abadi with all 25 of the interim Governing Council ministers protested to Paul Bremer and rejected the CPA's demand to privatize the state-owned companies and infrastructure prior to forming a legitimate government. The CPA, led by Bremer, fell out with Al-Abadi and the Governing Council. The CPA worked around the Governing Council, forming a new government that remained beholden to the CPA to serve until the general elections, prompting more aggressive armed actions by insurgents against US-led coalition personnel. While Al-Abadi was Minister of Communications, the CPA awarded licenses to three mobile operators to cover all parts of Iraq. Despite being rendered nearly powerless by the CPA, Al-Abadi was not prepared to be a rubber stamp and introduced more conditions for the licenses. Among them that a sovereign Iraqi government has the power to amend or terminate the licenses and introduce a fourth national license, which caused some friction with the CPA. In 2003, press reports indicated Iraqi officials were under investigation over a questionable deal involving Orascom, an Egypt-based telecoms company, which in late 2003 was awarded a contract to provide a mobile network to central Iraq. Al-Abadi asserted that there was no illicit dealing in the completed awards. In 2004, it was revealed that these allegations were fabrications, and a US Defense Department review found that telecommunications contracting had been illegally influenced in an unsuccessful effort led by disgraced US Deputy Undersecretary of Defense John A. Shaw and not by Iraqis. Between January and December 2005, he served as an adviser to the Prime Minister of Iraq in the first elected government. He was elected as a member of the Iraqi Parliament in the December 2005 parliamentary election and chaired the parliamentary committee for Economy, Investment and Reconstruction. Al-Abadi was re-elected in the 2010 parliamentary election as a member of the Iraqi Parliament representing Baghdad. In 2013, he chaired the Finance Committee and was at the center of a parliamentary dispute over the allocation of the 2013 Iraqi budget. Al-Abadi's name was circulated as a prime ministerial candidate during the formation of the Iraqi government in 2006 during which time Ibrahim al-Jaafari was replaced by Nouri al-Maliki as Prime Minister. In 2008, Al-Abadi remained steadfast in his support of Iraqi sovereignty, insisting on specific conditions to the agreement with the US regarding its presence in Iraq. In 2009, Al-Abadi was identified by the Middle East Economic Digest as a key person to watch in Iraq's reconstruction. He is an active member of the Iraq Petroleum Advisory Committee, participating in the Iraq Petroleum Conferences of 2009–2012 organized by Nawar Abdulhadi and Phillip Clarke of The CWC Group . He was one of several Iraqi politicians supporting a suit against Blackwater as a result of the 2010 dismissal of criminal charges against Blackwater personnel involved in the 2007 killing of 17 Iraqi civilians. Al-Abadi was again tipped as a possible Prime Minister during the tough negotiations between Iraqi political blocs after the elections of 2010 to choose a replacement to incumbent PM Nouri Al-Maliki. Again in 2014, he was nominated by Shia political parties as an alternative candidate for Prime Minister. At meeting with Russian president Vladimir Putin. On 24 July 2014, Fuad Masum became the new president of Iraq. He, in turn, nominated Al-Abadi for prime minister on 11 August. For the appointment to take effect, Al-Abadi was required to form a government to be confirmed by Parliament within 30 days. Al-Maliki, however, refused to give up his post and referred the matter to the federal court claiming the president's nomination was a "constitutional violation." He said, "The insistence on this until the end is to protect the state." On 14 August 2014, in the face of growing calls from world leaders and members of his own party, the embattled Prime Minister announced he was stepping down to make way for Al-Abadi. The Iraqi Parliament approved al-Abadi's new government and his presidential program on 8 September 2014. Since assuming office in September 2014, Abadi has made determined efforts to increase Sunni participation in the Iraqi government. Abadi appointed Khaled al-Obaidi, a prominent Sunni politician from Mosul, as his Defense Minister, and the appointment was ratified by the Iraqi parliament after two months. In mid-December 2014, Abadi forged a new revenue-sharing agreement with the Kurds, under which Baghdad agreed to pay the Kurdish Regional Government one half of all income from Kurdish-controlled oil fields. To counter the widespread corruption in the army stemming from the Maliki years, Abadi announced that 50,000 "ghost soldiers" had been identified and would be removed from army payrolls. "Ghost soldiers" were men on army payrolls who never showed up for duty, but paid their officers part of their salaries, thus institutionalizing corruption and hollowing out the armed forces. Iraqi President Fuad Masum paid a goodwill visit to Saudi Arabia in November 2014. In response, Saudi Arabia prepared to reopen its embassy in Baghdad, which had remained closed since the start of the Gulf War in 1990. Abadi has also visited Egypt, Jordan, and Turkey to discuss regional strategies to combat militant Islamist forces. Foreign Affairs magazine has written that after four months in power, Abadi's attempts to resolve Iraq's sectarian strife make his premiership "a welcome change from the schismatic style of his predecessor". As a result of Abadi's reforms, the United States has pledged $1.5 billion to train Iraqi forces and will resume the sale of F-16 fighter jets, suspended after the 2003 invasion of Iraq. Combating political corruption has been a major focus of the Al-Abadi administration. In August 2015, Al-Abadi unveiled a plan to strengthen the government by, among other things, eliminating security details for senior officials and cutting benefits to specific high-level officials. ↑ Harding, Luke (11 August 2014). "Haider al-Abadi: from exile in Britain to Iraq's next prime minister". The Guardian. Retrieved 22 January 2015. ↑ Pearson, Mike; Yan, Holly; Coren, Anna. "Iraq's Nuri al-Maliki digs in as President nominates new Prime Minister". CNN. Retrieved 8 September 2014. 1 2 3 "CV of Haider Jawad al-Abadi". Facebook. 10 February 2010. 1 2 "Haider al-Abadi, the designated Prime Minister of Iraq". CNN Arabic. 11 August 2014. ↑ "Iraq's new Prime Minister is graduate from University of Manchester". Manchester Evening News. Retrieved 2014-08-14. ↑ "Who is the new designated Prime Minister of Iraq, Haider al-Abadi?". BBC Arabic. 11 August 2014. 1 2 "CV of the new designated Iraqi Prime Minister, Haider al-Abadi". Euronews Arabic. 11 August 2014. ↑ Klein, Naomi (September 2004). "Baghdad Year Zero". Information Clearing House. Harper's Magazine. ↑ "US probe fails to stop mobile licence awards". TeleGeography. PriMetrica, Inc. 20 December 2003. ↑ Miller, T. Christian (29 April 2004). "Iraq Cellular Project Leads to U.S. Inquiry". Los Angeles Times. 1 2 "People to Watch 2009: Twelve Key Figures for the Region in the Coming Year". Middle East Economic Digest. 53 (1). January 2, 2009. ↑ Omar al-Shaher (January 17, 2013). "Iraqi Parliament Struggles to Ratify Budget Amid Political Crisis". Al-Monitor Iraq Pulse. ↑ "Crocker: No permanent bases will be set up in Iraq". USA Today. June 5, 2008. ↑ Advisory Committee. "Iraq Petroleum Advisory Committee". ↑ Webb, Susan (January 5, 2010). "Iraq sues Blackwater over killing spree". People's World. ↑ "Iraq crisis: Turmoil over PM Nouri Maliki's status". BBC News. 11 August 2014. ↑ Madi, Mohamed (11 August 2014). 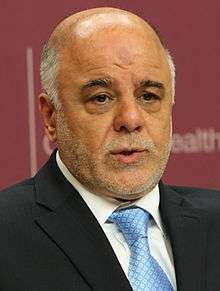 "Profile: Haider al-Abadi, Iraqi PM in waiting". BBC. Retrieved 2014-08-12. ↑ Ashton, Adam (August 11, 2014). "Haider al Abadi named to replace Maliki as troops take to Baghdad's streets". McClatchyDC. Retrieved 2014-08-12. ↑ "Iraq's Incumbent PM Nouri Al-Maliki Grows More Isolated As He Clings To Power". Huffington Post. 13 August 2014. Retrieved 14 August 2014. ↑ Madi, Mohamed (September 9, 2014). "Haider al-Abadi: A new era for Iraq?". BBC News. Retrieved August 8, 2015. 1 2 3 4 5 6 7 Almaliky, Muhamed (January 16, 2015). "Mending Iraq". Foreignaffairs.com. Retrieved August 8, 2015. ↑ Wvans, Dominic (December 1, 2014). "Iraq says it found 50,000 'ghost soldiers' on payroll". Reuters.com. Retrieved August 8, 2015. 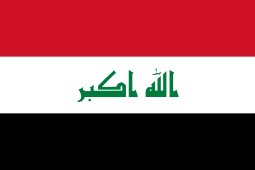 ↑ Shinkman, Paul D. "Prime Minister Abadi Unveils a Bold Plan for Iraq". Retrieved 2015-10-07.